Every dog loves to play fetch, but it requires at least one human to be around to be able to do so. But one resourceful dog came up with an idea to catch people as they’re walking by his gate. He sticks his head out with a toy in his mouth to get them to throw it for him. 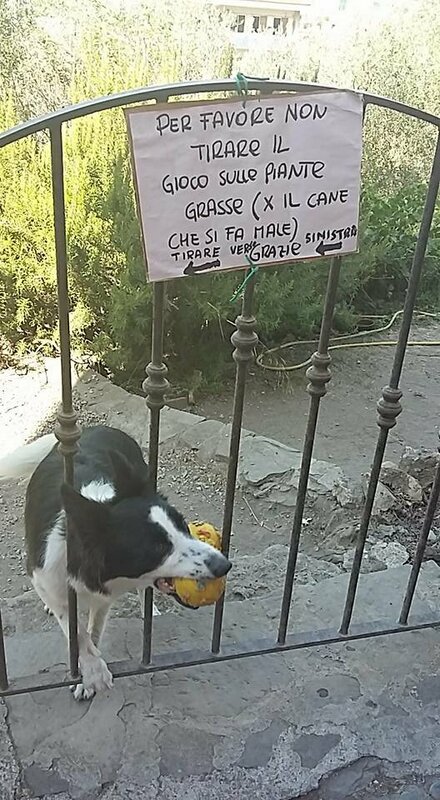 He’s done this for so long his owner even made up a sign that hangs right above his head on the fence! Lots of dogs here are following their owners into the restroom, but my favorite one has to be the dog who wants to go to bed despite mom wanting to stay up and watch movies. Their back-and-forth has me laughing out loud! What is your favorite part of Dogs Don’t Understand Personal Space Compilation Part 2? There’s nothing more precious than a baby’s laughter. And when you add a dog into the mix, it’s cuteness overload! Here, Zoey the Labrador is trying to start her human sibling off right by showing him that green beans are good. But Baby Chase can’t stop laughing! We’ve all experienced a moment when our dogs do something brilliant. But when you try to have them repeat it for someone else, it’s not happening! If only you would’ve recorded it, then they’d have to believe you! Oliver is just a puppy, and he’s trying real hard to learn to come down the stairs. He’s getting a little farther each time but still freaks out and heads back up to start all the way over. This time he only makes it a few steps, and he’s got a surprise for dad!